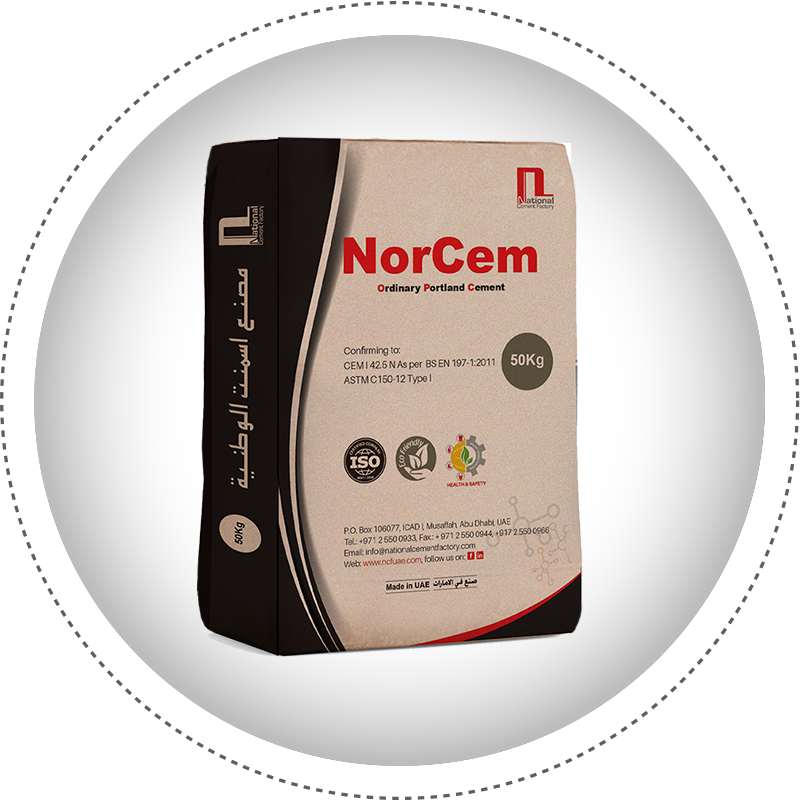 NCF introduced its Ordinary Portland Cement as "NorCem". It is a high-quality, cost-effective building material. It is produced by inter grinding of high grade clinker with high C3S content and right quality gypsum in predetermined proportions. It is widely used in all general and semi specialized construction works like plain and reinforced cement concrete works, brick and stone masonry, plastering and flooring. NCF’s NorCem is extremely easy to work with and produces consistently excellent results every time. This consistent quality, versatility and proven strength make it the choice for Builders, Architects, Engineers and Contractors. NCF’s NorCem surpasses all Chemical & Physical requirements of BS EN 197-1:2011 & ASTM C 150-12 Type I standards. NCF plant has gone beyond government regulations and local laws to ensure that processes and policies contribute in making our communities a better places to live and work in. NCF has won many laurels for its cement production and has ISO 9001, ISO 14001 and ISO 18001 certifications. It has grown steadily from time to time through its consistent quality and customer service. Our OPC is compliant to both ASTM and British Standards. NCF introduced its Ground Granulated Blast Furnace Slag (GGBFS) as "ProCem". It is a green building material for sustainable constructions. It is manufactured by grinding of superior quality GBFS having high activity index, high glass content and potential phases. The chemical composition and uniform particle size distribution of NCF’s ProCem contributes to the production of superior cement concrete. Over long period of time, its load-bearing properties continue to increase as it absorbs surplus lime released during hydration to form more calcium silicate hydrates. These hydrates add to the strength of the cement. It is off-white in colour and substantially lighter than Portland cement. Resultantly it helps soften the visual impact of large structures such as bridges and retaining walls. NCF’s ProCem surpasses all Chemical & Physical requirements of BS EN 15167-1:2006, BS 6699:1992 & ASTM C-989-10 Standards. NCF has won many laurels for its GGBFS production and has ISO 9001, ISO 14001 and ISO 18001 certifications. It has grown steadily through its consistent quality and customer service. 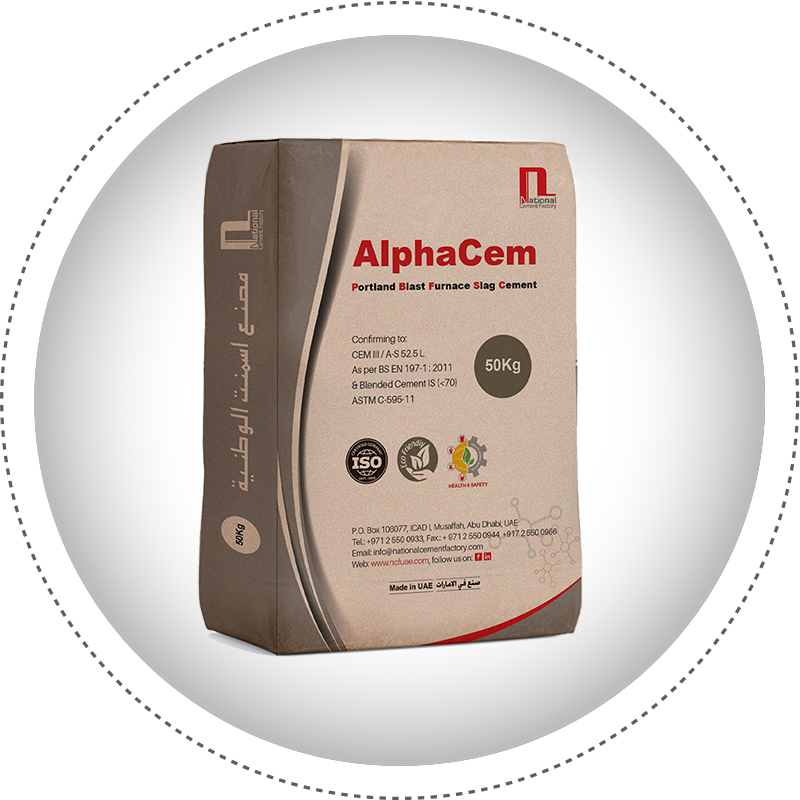 NCF introduced its Portland Blast Furnace Slag Cement (PSC) as "AlphaCem". It is a Green building material for sustainable construction. AlphaCem is manufactured by uniform inter-grinding of high quality clinker blended with judicious amounts of superior blast furnace slag having high glass content and with gypsum. AlphaCem contains minimum 50% slag and its unique Chemical & Physical properties make it ideal for use in high performance concrete and suitable for mass construction due to its low heat of hydration. The Strength development of concrete made with AlphaCem is slower at early ages (less than 7 days) than concrete made with OPC but later strength (28D) of concrete would be higher than OPC concrete due to secondary hydration. Moreover, the AlphaCem concrete will continue to gain strength up to 56 days and 90 days. Elastic modulus is slightly higher than Portland cement concrete although creep is substantially reduced. NCF’s AlphaCem surpasses all Chemical & Physical requirements of BS EN 197-1 CEM III A-S 52.5 L and ASTM C 595 standards. NCF has won many laurels for its AlphaCem production and has ISO 9001, ISO 14001 and ISO 18001 certifications. It has grown steadily from time to time through its consistent quality and customer service. NCF introduced its Sulfate Resisting Portland Blast Furnace Slag Cement (PSC) as "SRCem". It is a Green building material for sustainable construction. SRCem is manufactured by uniform inter-grinding of high quality clinker blended with judicious amounts of superior blast furnace slag having high glass content and with gypsum. As per LEED (Leadership in Energy and Environmental Design) requirement Blended Cement contains 50-65% slag which makes it equivalent to Type V SRC. 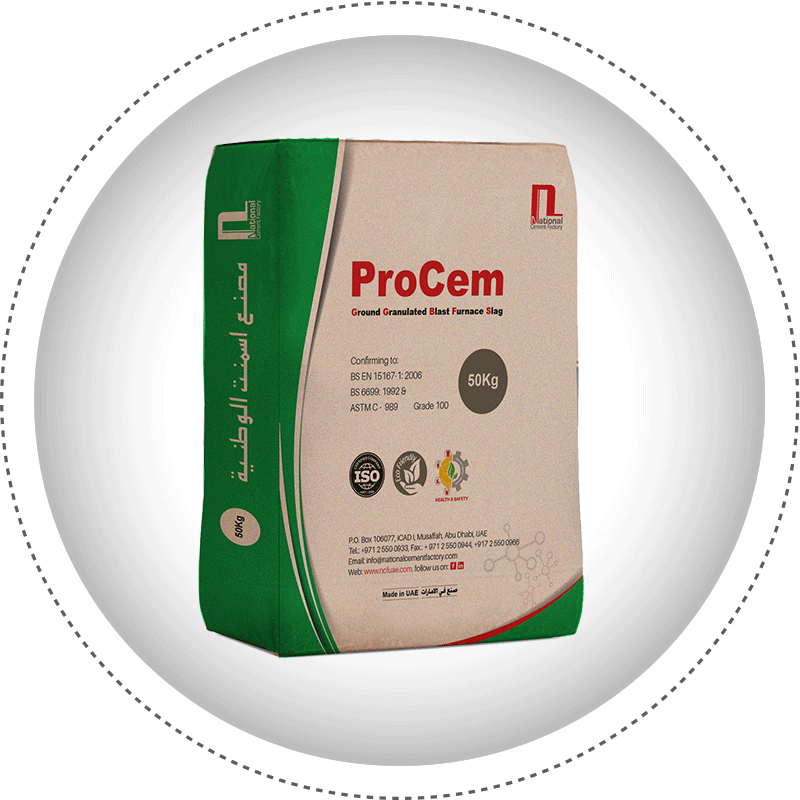 SRCem’s unique Chemical & Physical properties make it ideal for use in high performance concrete and suitable for mass construction due to its low heat of hydration. SRCem Possess excellent PSD with maximum particle size of 30 µm, RRSB value reaching to 0.96, which explains its narrower Particle distribution. Therefore, this material can be used as a replacement of Micro fine cement where Sulfate resistant properties are required like Geotechnical Grout and Soil stabilization. 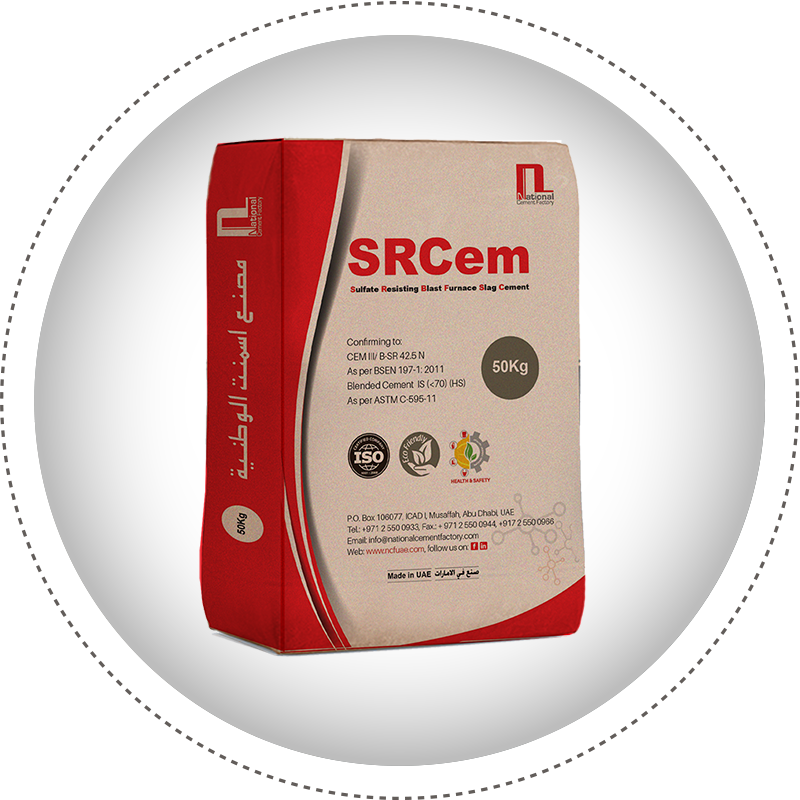 NCF’s SRCem surpasses all Chemical & Physical requirements of CEM III B-SR 42.5 N as per BS EN 197-1 and ASTM C 595 IS(<70)HS standards. NCF has won many laurels for its SRCem production and has ISO 9001, ISO 14001 and ISO 18001 certifications. It has grown steadily from time to time through its consistent quality and customer service. 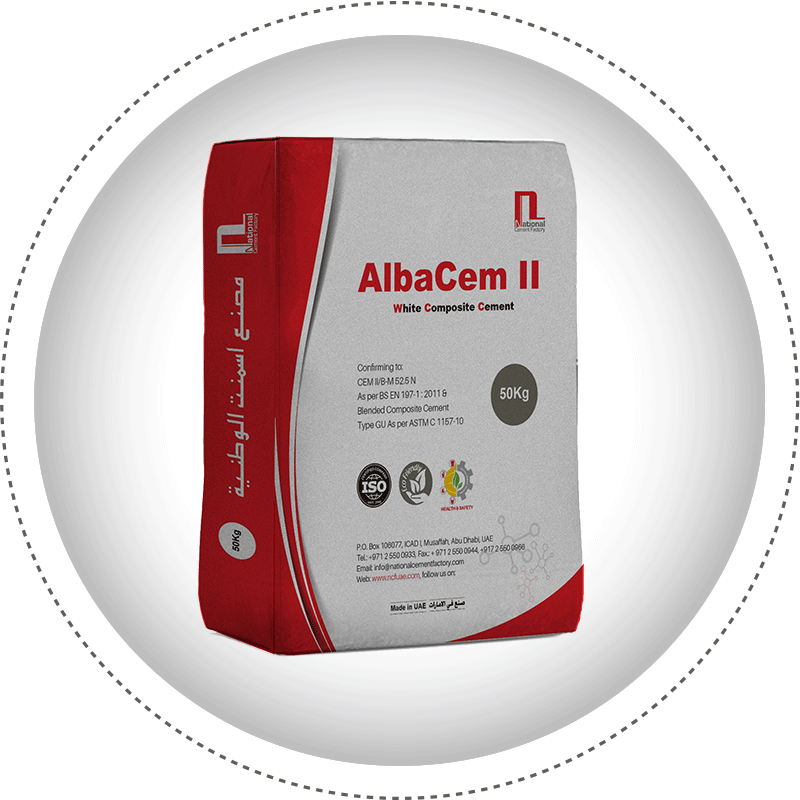 NCF introduced its White Composite Cement as "AlbaCem". It is a Green product for high-quality building material for Architectural purposes. It is produced by inter-grinding of high quality of White clinker and Gypsum with small portions of SCMs. NCF is the first plant which developed, manufactured and introduced the White Composite Cement in UAE market. Its continuous efforts in R&D assured the product has Superior Quality. AlbaCem is suitable for all applications where classical white cement is used. NCF’s AlbaCem surpasses all Chemical & Physical requirements of CEM II B-M 52.5N as per BS EN 197-1:2011 & ASTM C 1157-10 TYPE GU Standards.